Why is there a charge from Track Your Plaque, LLC on my credit card statement? Track Your Plaque, LLC is the corporate entity that operates the Undoctored Inner Circle website. It was created when Dr. Davis launched his first health website, TrackYourPlaque.com, over 10 years ago and has been in continuous operation since then. Undoctored: Why Health Care Has Failed You and How You Can Become Smarter Than Your Doctor is a book by Dr. William Davis, as well as a website and a philosophy that rejects the idea that the doctor is the authoritarian dictator of healthcare and you are the unquestioning, obedient patient. While this may have worked in past, it is a woefully outdated concept today, especially in view of the tidal wave of health information coming our way in the Information Age. The informational playing field has been leveled and the clinical studies and other health information available to your neurologist, endocrinologist, or primary care physician are also available to you—there’s no difference. While you don’t have the depth of experience or breadth of medical knowledge of a physician, you have something even better, even more powerful: the ability to draw from collaborative communities. This is the age of crowd-sourced wisdom. When the wisdom of hundreds, thousands, or tens of thousands of people are combined, it exceeds the wisdom of any single expert. These are the basic principles that underlie the Undoctored book and approach, all combined into a program that helps you take back control over health and reverse hundreds of health conditions—no doctor, medical diploma, or Mercedes with “MD” on the license plate required. Do I Need to Be in Ketosis? The short answer is, "No you do not need to be in ketosis to follow the Undoctored program." To learn more about ketosis, watch and listen to Dr. Davis explain the details in the video below. Isn't it dangerous to allow people to take control over their own health? Let’s be clear: The Undoctored program is not about diagnosing your own health condition. It is not about obtaining prescription medications or medical procedures on your own. It is not about engaging in alternative practices that, just because they are outside the mainstream, are assumed to be better. Undoctored is none of that. Undoctored begins with a basic premise: If everyone engages in a simple menu of health practices, health is restored. This is delivered through our Undoctored Wild, Naked, and Unwashed program. Depending on your list of starting health conditions, improvement or reversal can occur within days, while other conditions require weeks to months. Autoimmune conditions, for instance, improve or reverse typically over months of the Undoctored approach, while acid reflux, irritable bowel syndrome, and migraine headaches can reverse within days. So it does not matter if you begin with a label of rheumatoid arthritis, or obesity, or hypertension, or high cholesterol, or depression, or eczema, or hundreds of other chronic health conditions—regardless of the starting label, the majority of health conditions will reverse. Do all health conditions respond to the Undoctored program? No, of course not. Health conditions that are genetically-determined, due to injury, or infection will not respond. The health conditions that do respond, however, are among the most common among modern people, are responsible for the bulk of healthcare interactions, and typically generate several prescriptions from the doctor for every individual. Conditions that do respond are among the most familiar: type 2 diabetes, hypertension, high cholesterol, irritable bowel syndrome, acid reflux, asthma, skin rashes, and hundreds of others. There are also metabolic health conditions that do not fully respond to the Undoctored program. Such conditions typically improve with these efforts, but some additional steps are required for full benefit. This is why we add the Undoctored Protocols that add to the basic Undoctored Wild, Naked, and Unwashed Program to obtain better results, for example, with stopping or reversing calcium oxalate kidney stones, coronary disease risk, or breaking a weight loss plateau. The strategies in Undoctored Protocols, as with strategies in the basic program, are all safe and natural, while achieving extraordinary results. Will the Undoctored program lead to weight loss? Carrying excess body weight is just another manifestation of health gone wrong. Undoctored restores health in so many ways that weight loss becomes effortless, just part of the overall return to health. While results vary depending on body size, age, hormonal status, etc., people typically lose 15 to 18 pounds on their first month of this lifestyle, more over longer periods and often adding up to astounding amounts of weight lost. Can you completely divorce yourself from reliance on the doctor and healthcare system? No, as you may occasionally need them to, for instance, manage an injury from a car accident or stumbling while playing tennis or treat a gastrointestinal infection you acquired while vacationing in South America. There can also be genetic conditions or health conditions acquired before adopting the Undoctored program that require conventional medical attention. What Undoctored does, however, is slash your need for the doctor and healthcare to an absolute minimum. If, for example, you achieve ideal weight and enjoy ideal blood sugars, blood pressure, cholesterol values, and reverse all inflammation, your risk of developing heart disease, diabetes, arthritis, dementia, and other health conditions is sharply reduced. Undoctored makes your need for the healthcare system unlikely, thereby sparing you the exceptional cost, aggravation, and dangers that come with conventional healthcare. You say that the enemy of the healthcare industry is not sickness but healthy people. What do you mean by that? Over the past fifty years, the healthcare industry has gradually lost sight of its primary mission: keeping people healthy. Instead, it has replaced its healing mission with a profit mission: generating maximum revenue to benefit healthcare insiders such as executives in the drug and medical device industries, hospital executives, physicians, and others with decision-making power. It means that any interaction with a doctor or hospital is almost inevitably determined by a desire to extract maximum revenue from you and your health insurance. It also means that the world of wonderful, individual health-empowering information that could be conveyed to you is simply not—because it doesn’t pay. I say that the enemy of the healthcare industry is healthy people because, if you are healthy, you are absolutely useless as a revenue source (though that doesn’t always stop them convincing you that even healthy people “need” statin cholesterol drugs and other drugs and services that try to monetize health). This is the enormous information gap that Undoctored seeks to fill, providing safe, effective, non-profit-motivated guidance to help you become healthy and free of the predatory practices of modern healthcare. Over the past fifty years, the healthcare industry has gradually lost sight of its primary mission: keeping people healthy. Instead, it has replaced its healing mission with a profit mission: generating maximum revenue to benefit healthcare insiders such as executives in the drug and medical device industries, hospital executives, physicians, and others with decision-making power. It means that any interaction with a doctor or hospital is almost inevitably determined by a desire to extract maximum revenue from you and your health insurance. It also means that the world of wonderful, individual health-empowering information that could be conveyed to you is simply not—because it doesn’t pay. I say that the enemy of the healthcare industry is healthy people because, if you are healthy, you are absolutely useless as a revenue source (though that doesn’t always stop them convincing you that even healthy people “need” statin cholesterol drugs and other drugs and services that try to monetize health). This is the enormous information gap that Undoctored seeks to fill, providing safe, effective, non-profit-motivated guidance to help you become healthy and free of the predatory practices of modern healthcare. 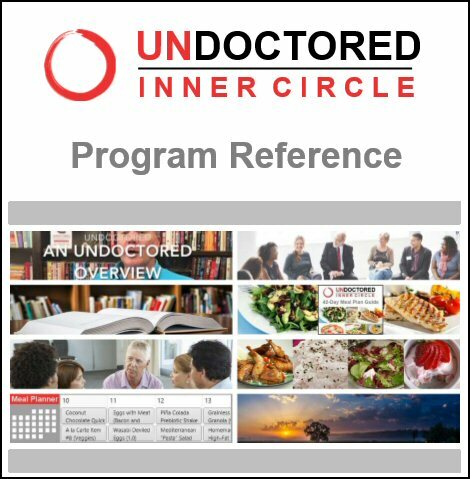 Is there a role for my doctor in the Undoctored program? There can be. But the role should be that of supporter, health advocate, someone who helps you succeed in regaining health. The doctor should not be someone who discourages you, pokes fun at your ideas, thrusts prescriptions at you without full explanation and insists on hospital procedures. If you have such a doctor, fire that doctor and find one who supports your efforts and works with you collaboratively. Our Undoctored U is in the process of training practitioners nationwide so that, over time, we can provide a database of nationwide health advocates schooled in Undoctored principles who you can rely on.